Now, let’s just welcome the dark, redolent, beautiful first weekend of spring. This weekend, take a walk on the wild side…or at least the shadowy side with Noir City: Hollywood, the 16th Annual Festival of Film Noir. The fest title might be long but the features, highlighting double-crossing dames, con men, and crime-solving dicks (that’s noir slang for “detectives”, doncha know), tend to be lean, mean, and as hard-boiled as the dialogue. The fest opens with a Dan Duryea double feature including the newly restored, once-thought-lost Too Late for Tears as well as Larceny, notable for a pistol-packing Shelley Winters and wisecracking patter. In addition to films from the U.S., Great Britain, Italy, and France, this year’s fest, presented by American Cinematheque and the Film Noir Foundation, features panel discussions, tributes to writer David Goodis and director Hugo Fregonese, and a closing weekend party. Keep an eye on The Go Go for more party deets. You can hear the tom toms already. NOIR CITY: HOLLYWOOD, THE 16TH ANNUAL FESTIVAL OF FILM NOIR — Fri, March 21 – April 6. All films 7:30; $7-$11 — Egyptian Theater, 6712 Hollywood Blvd, Hollywood 90028 Get tix HERE. Craving a spring fling this weekend? Head to the Los Angeles Art Association/Gallery 825 for The New Baroque: a multi-media show exuberantly curated by gallerist Martha Otero and dedicated to all things decorative and over-the-top delightful. Adding more bees to your spring bonnet: three, intriguing solo exhibitions. 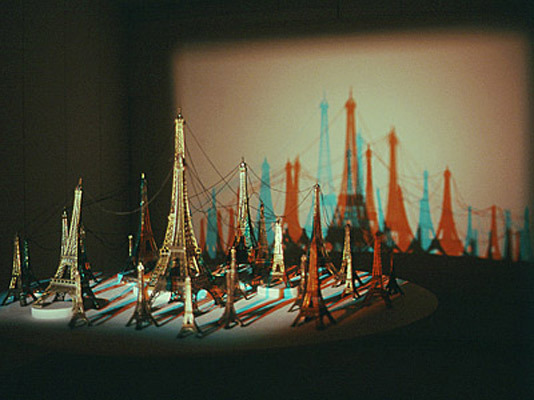 Keiko Inoh‘s Shadow (at left) presents a city that never sleeps by combining projections of metal structures with a lazy Susan-turntable to create a compelling, ever-changing,”camera-less photograph”. The black and white, pastel and graphite drawings in Robert Nelson‘s Babies, Bunnies and Bombs are as provocative as the show’s title. Nelson deftly juxtaposes the creepy with the comforting to provoke skittish laughter and have-to-look-again images. …where it’s also kind of spring. THE NEW BAROQUE — Sat, March 22 – Fri, April 18. Opening reception: Sat 6-9pm. FREE — Los Angeles Art Association/Gallery 825, 825 No La Cienega Blvd, LA 90069. More info HERE. Ms. Go Go has always thought it odd that the New Year is celebrated in the dead of winter rather than spring. Maybe it was the best medieval boosterism campaign ever. Whatever the origin, it seems especially appropriate to celebrate the Iranian New Year Nowruz — which translates as “New Day” — with a kick-off-spring bash this Sunday at LACMA. Presented in connection with the Farhang Foundation, the all day/all ages festival includes storytelling, Persian dance, displays of calligraphy, docent-led tours of the museum’s Ancient Iran collection, and puppet shows. You’ve always been a sucker for Persian puppets. The festival is free except for the world premiere of Ziba Shirazi‘s Spring Love: a ticketed event in the Bing Theater. Additional short films will be screened for free in the Brown Auditorium. There will also be a Haft Sin display — a traditional Nowruz feast — while Persian-themed cuisine by Chef Hoss Zare (The Fly Trap, San Francisco) and Chef Rui Wang (Patina, Los Angeles) will be available throughout the LACMA grounds. Yum. The London-based group Ajam will explore the celebration of Nowruz along the Persian Gulf through music. The public is invited to participate in the parade of traditional costumes; since the purchase of new clothes is an integral part of Nowruz, you’ll have an excuse to get that jeweled dagger you’ve been coveting! 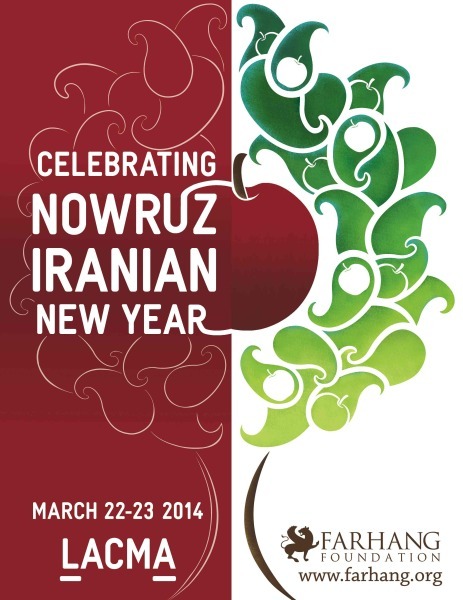 NOWRUZ CELEBRATION — Sun, March 23, 11:30 am – 7 pm. Free except for Spring Love premiere; get tix HERE — LACMA, 5905 Wilshire Blvd, LA 90036. More info HERE. Next Post The Weekend Go Go: Free Horror, A Grand Bookfest, Noodle Up + More!